Although I've used Sonar for years, I've never actually used it to record audio. But today I decided to test using a USB microphone Blue Yeti. (As ASIO does not recognize a USB microphone, I am using WASAPI Shared). However, the recording has a long delay, meaning the voice is heard at least 0.5 seconds after the metronome is played. How do I get this compensation so that both the recording and the metronome are synchronized? 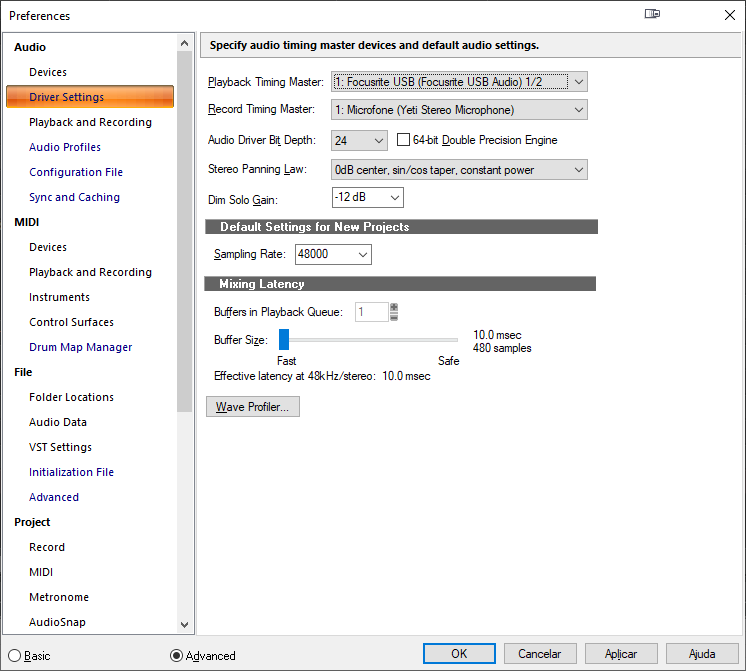 Try lowering your buffer settings by going to EDIT>PREFERENCES and look for the "Audio Device" tab. I think you actually refer to Preferences -> Audio -> Driver Settings, right? In any case, as you can see in the image that I put in the original post, the buffer is at a minimum. I do not think this is the solution. Return the microphone and purchase one that connects to your Focusrite interface. The Focusrite is capable of much lower latency using its ASIO driver when monitoring through the DAW or even less using direct monitoring (mixing the DAW output with the direct signal from the interface inputs). I know, but my question is whether there is any way in Sonar to compensate for this delay, that is, at the time of audio playback, to force the audio to be played a bit before it is positioned, to compensate for this problem? Look under Pref>Audio>Sync and Caching. Its "Record Latency Adjustment" at the bottom of the page. Also, I know it's not a microphone made for recording songs, but throwing it out is not the best argument, since it works perfectly within Adobe Audition, so the problem is the limitation of Sonar in synchronizing the microphone delay, and is not properly a problem with the USB microphone, since this works well in other software. Manual Offset is what you would use to correct this. However that should be set for the Scarlett. Do a loopback recording through the Yeti and determine exactly how far off it is. Then just slide any clips you record through it forward by that amount of time. Since you rarely use this mic with CbB, just moving the clip is going to be the simplest and least time consuming option. Keep in mind that using more than one interface at a time is often problematic (can't be done at all with native ASIO drivers) in any DAW. Only ASIO will compensate latency offset correctly. All other driver modes do not report correctly to Sonar so therefore the error in offset. This is not Sonars fault, this is the limitation of those drivers. As said best to always use your ASIO driver and then just nudge the resulting audio to it's correct position. You could use the manual offset but then you better remember to put it back when done. Don't you need to run Wave Profiler with a new device when using WASAPI? Cakewalk will do this automatically when you swicth modes. But that has nothing to do with the OT.